Five Indian soldiers serving with the United Nations peacekeeping operation in South Sudan were killed in an ambush last week that also left seven civilian U.N. staff dead and four more troops wounded. Such casualties are grimly familiar for the Indian army, which has lost more personnel on blue helmet missions than any other country’s military. 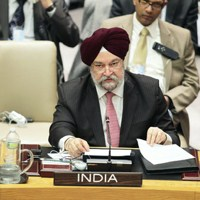 But the attack capped off a difficult few weeks for India at the U.N., marked by diplomatic disputes over the rules of peacekeeping and the new Arms Trade Treaty. Cumulatively, these episodes may reinforce doubts about New Delhi’s commitment to the U.N. system.